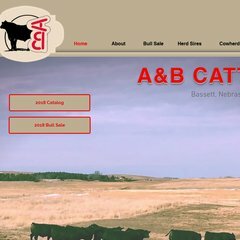 Topics: A & B Cattle, Arlen And Becky Sawyer, and Bull Sale. It is hosted by Att Lincroft Ort (New Jersey, Middletown,) using Microsoft-IIS/6 web server. There are 4 DNS records, such as webserver03.angusweb.angus.org, ns1.swbell.net, and webserver01.angusweb.angus.org. The programming language environment is ASP.NET. PING www. (12.40.42.134) 56(84) bytes of data.